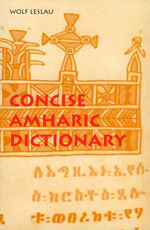 Although Amharic is the national language of Ethiopia and English its international language, until publication of this book in hardcover there was no concise Amharic-English, English-Amharic dictionary. Students of Amharic as well as visitors to Ethiopia and foreign workers will benefit from this concise dictionary with phonetic transcriptions that allow for its use by those unfamiliar with Amharic script. Wolf Leslau is Professor of Near Eastern Languages Emeritus at the University of California, Los Angeles, and the author of Amharic Textbook.